Three-wire socket lights the top only, the cabinet only, or both at the same time. Hinged door provides easy access. Lamp base is shaped like a putting green. Bracket holds putter on side of project as pictured for quick practice putts. Target your ball toward the recess in the base. Cabinet stands 48-1/2"H. Patterns drawn FULL SIZE. 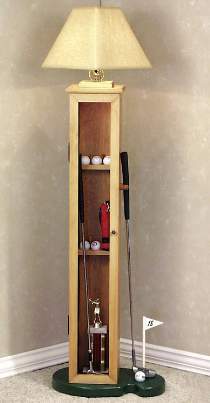 Golf Display Lamp Hardware Parts Package includes 3-wire socket, candelabra socket, lamp harp and finial, 8 foot cord set, non-mortise hinges, knob, magnetic catch, turn buttons and dowel. Project plan, light bulbs, glass, wood and wood finish not included.